Offer Coal, Bananas,or Watermelon, Coconut, Water and incense – flowers too. Then say “I pay reverence and offerings to the Four Eared Five Eyed Deva – Indra Transformed! I beg to offer reverence with these pieces of coal”. Give Offerings on the Full Moon days at Midnight will bring the best results. Black Coals, Black grapes, 9 Boiled Eggs, Pineapple, Bananas, 1 Glass of Water,Yellow Chrysanthemums, Jasmine Flowers and 18 Incense sticks. Taep See Hoo Ha Dtaa, is part of a legend attached to the building of the Temple of Wat Khao Kway Gaew in Chiang Rai – this creature exists in the temple there as a statue. This creature’s dung (excrement) is pure gold. It is supposed to be the reason that men love their mistress more than their first and main wife (in Thailand many men have a “Mia Hlwong” (main wife) and a “Mia Noi” (second wife/mistress). The five eyes mean the five precepts (not killing not stealing not indulging in perverse sexual or adulterous behavior, not lying and not taking alcohol or intoxicating substances such as drugs). Taep See Hoo Ha Dtaa is rather like a bear in appearance, and small in stature, it eats coals and excretes solid gold. 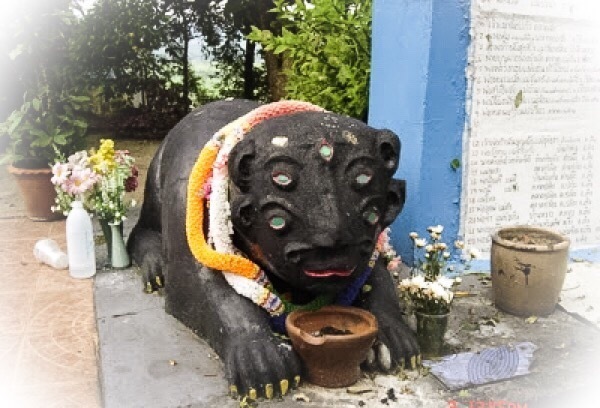 One is “Meng See Hoo Ha Dtaa” (five eyes four ears) and is part of a legend attached to the building of the Temple of Wat Khao Kway Gaew in Chiang Rai – this creature exists in the temple there as a statue This creature’s dung (excrement) is pure gold. It is supposed to be the reason theat men love their mistress more than their first and main wife (in Thailand many men have a “Mia Hlwong” (main wife) and a “Mia Noi” (second wife/mistress). The first version of this creature “Meng See Hoo Ha Dtaa” (above picture), Meng See Hoo Ha Dtaa is like a bear a little bit and small in stature, it eats coals and excretes solid gold. About one thousand years ago, there was a city called nakorn Pantumid, with it’s ruler “Pra Jao Pantumit Racha”. The city was a peaceful one withoout any problems, and its ruler Pra Jao Pantumit had seven wives to his name. In this city there was a poor family of three (Mother Father and child) the child went by the name of Aay Tuggatta. When Aay was only four years old, his mother died. After this, when Aay Tuggatta wenr begging, some people had compassion and welcomed him, giving him alms, and others would chase him away. When he was 12 years old, his father sent him to work as a cow herder for a village chieftan, but after not many years, his father bacame terribly sick, and thinking that he would not live for long, he taught his son to have moral precepts, and told him that when he died, he should bury him in the forest until his skull fell off, and then should take the skull and place it on the altar in the house to rever. He was told that when Aay should reach the age of seventeen, that he should take the skull onto a mountain to the south west,; wherever the skull migh get caught up, then there should it be buried, and in that place set an animal trap. If an animal should gte caught in the trap, then he should take it and look after it. After having explained his wishes, his father died. So the young Aay took his father’s skull up the mountain until it got stuck in front of the mouth of a cave, and there he set his trap for the animal. After 3 or 4 days, he returned and found that there was a very strange animal indeed caught in the trap. this animal looked like a bear, short in stature, with wide eyes, green in color. It had all of five eyes and four ears, and he gave it the name “Meng See Hoo Ha Dtaa”, meaning “creature with five eyes and four ears”. Aay thought that this must be his father reborn as the strange animal, and took it to keep at home, building a small coop for it and bringing it some food and water. But Meng Ha ta See Hoo would not eat anything he gave it, and he became worried, because he didn’t really have much time to care for the animal, due to the fact that he had to work as a cowherd every day. It was cold season, and so when Aay returned home from work, he lit a fire and burnt it to make coals. It so happened that one of the hot coals sprang out of the fire and landed near meng ha ta see hoo; with great hunger in his eyes, meng See Hoo Ha Dtaa ran forward and snatched the burning ember of coal and ate it. Aay was curious to see if meng ha ta see hoo would eat the rest, and let him approach the fire. The animal wolfed the coals down as if they were a plate of delicacies! the next day, meng ha ta see hoo dropped dung that was pure gold, and many pieces were they indeed! When Aay saw this, he began to bring hot coals to the animal each evening to eat, and each morning there were piles of golden pellets to collect, which Aa then took and buried under the ground to hide them. Some time later, there was rumors and news of the great beauty of the princess Pra Nang Sima (daughter of Pra Jao Pantumid Racha, the ruler of the realm) being spread around the nation. many people wished her to accept their marriage offers, and lords and ladies and nobles in their hundreds began to appear in the district to compete for her affections. To deal with this, Pra Jao Pantumid Racha decided that whoever should win her hand should build a well made of solid gold and bring it to the palace. He set this out as a condition of marriage thinking that it would be extremely unlikely that anyone would acheive such a thing, and that thus the crowds who had come to give courtship would disappear and things would quieten down again. But Aay heard the news and hired an artesan to construct a water container of the solid gold he had collected from men ha ta see hoo and then had it carried to the royal palace. When Pra Jao Pantumid Racha saw the golden water well, he sent a servant to see where it had been brought from, and upon recieving the news that it came from the house of Aay, he ordered a road to be built from the palace to his house, upon completion of which, should the marriage ceremony be conducted. So the young Aay recieved the hand of the princess in marriage. After the marriage, Pra Jao Pantumid Racha asked Aaay where the gold had come from, and Aay answered honestly that it had come from meng ha ta see hoo. Pra Jao Pantumid Rach ordered the gold to be dug up from the garden, which took 7 days and nights to recover. The king then took the gold as his prize, and asked further where meng ha ta see hoo was, and to bring it for him to see. Aay brought the animal but meng ha ta see hoo was afraid of Pra Jao Pantumid Racha and ran away. Pra Jao Pantumid Rach ordered his servants to chase and catch the animal, which they had to do three times before finally managing to stop it from fleeing again and managed to put it in a cage. One day, as Pra Jao Pantumid Racha wanted to stroke the animal and opened the cage to do so, meng ha ta see hoo sprang out and ran away again, with Pra Jao Pantumid Racha chasing after. Pra Jao Pantumid Rach ran until reaching the mouth of the cave where hethought meng ha ta see hoo had entered to hide, and ran inside it.Once he had entered, a landslide occured and closed the mouth of the cave, and trapped Pra Jao Pantumid Racha inside it. the servants of Pra Jao Pantumid Racha looked everywhere but were unable to find their king. Pra Jao Pantumid Racha began to blame himself that this was all because of greed for wanting to keep meng ha ta see hoo that he was trapped inside the cave, and began to thiink he would surely die there. Then the land slid a little further and there was a small opening in the rocks blocking the cave entrance, and Pra Jao Pantumid Racha was able to shout to his servants to go and bring all 7 of his wives to the cave. They should then open their skirts and let their king and husband see their sexual organs for the last time before he should die. His wives came with great embarrasment and shame to the cave, opened their skirts and showed their private parts. Then something amazing happened; A sound of laughter came from the cave, causing the cave mouth to be opened and unblocked, and Pra Jao Pantumid Racha was able to escape from his entrapment, and crying out in relief to his harem that he would love all of them his lesser wives, more than his royal queen (main wife). When they had returned to the city, they continued living as happily as before, until Pra Jao Pantumid Racha relinquished his throne to Aay (who was now his son and heir to the throne), and renamed Aay as Prayaa Tammikaracha. There were 7 days of celebrations, and monks of the Buddhist sangha came to preach the Dhamma, bringing with the the Boroma Saree Rikadhatu (Buddha relics) of the Buddha’s left little finger bone, and offering it as a gift to the realm.Prayaa Tammikaracha thus constructed a temple for it to be placed in and revered, and many other temples in the vicinity too. He built wat Doi Khao Kway Gaew, and placed the relic of Buddha’s fingerbone in the Chedi stupa there. This temple is built on the Doi (mountain) which has the cave where Meng Ha Ta See Hoo was found, and is now known as Wat Doi Khao Kway Gaew. 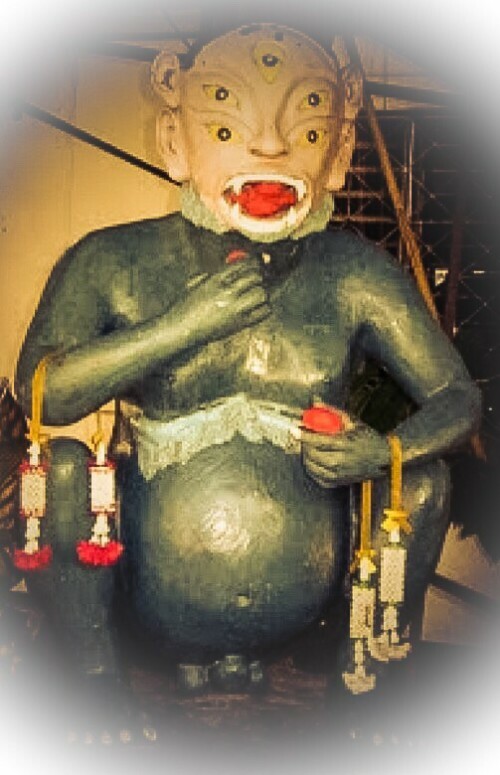 The other version of this Deity to be found is slightly different, and called ‘Paya Wanorn See Hoo Ha Ta’. 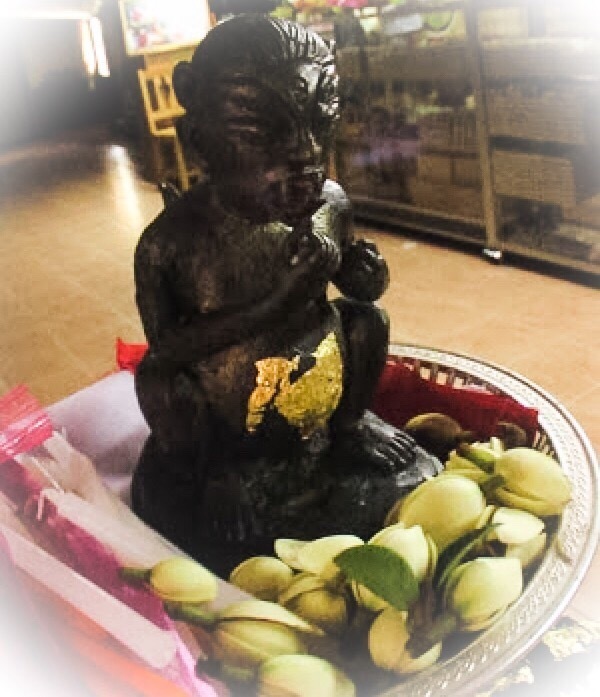 In this legend “See Hoo Ha Dtaa” is in the shape of a monkey, and named “Paya Wanorn See Hoo Haa Dtaa” This image is greatly revered in Chiang Mai and Lampun and was created into a statue by Pra Dto Dtidta Wiriyo of Chiang Mai. There is a ritual ceremony which people of Chiang Rai like to play for to bring luck and fortune, by playing the game of Meng See Hoo Ha Dtaa.